From the A9, head west on the A827 from the Ballinluig junction. Follow this road, through the town of Aberfeldy (approx 10 miles) and continue on to Kenmore (a further 6 miles). Situated at the eastern end of Loch Tay in the Perthshire highlands, the charming village of Kenmore is surrounded by some of Scotland's most stunning scenery. The area is full of history: Queen Victoria spent her honeymoon at nearby Taymouth Castle and it was this visit that sparked her love affair with Scotland. Whether you are looking for an action packed outdoor activities holiday or lazy family picnics by the loch watching the children paddle, Kenmore has it all. The fantastic location of this great cottage means that once you arrive, you can park the car and forget about it until it's time to go home! The list of activities available within walking distance of the cottage is endless - walking, cycling, bird watching, climbing, kayaking and many more. 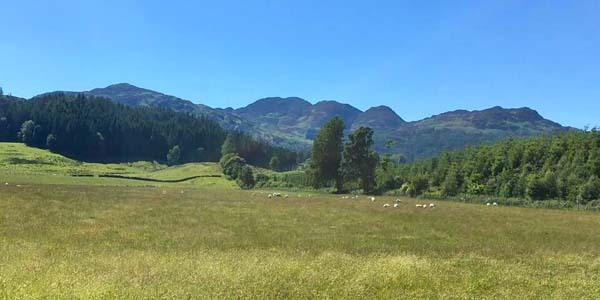 If you do want to explore further afield then Glen Lyon, Scotland's longest and loveliest glen, is nearby, majestic Ben Lawers is a short distance along the loch or visit Fortingall village just a few miles away which boasts Britain's oldest tree and has beautiful thatched cottages. If shopping is your thing then don't miss a visit to The House of Bruar at Blair Atholl, known as the Harrods of the North or closer to hand is the House of Menzies with gifts, wine and a small cafe catering for the coffee lover. Golfers will be in their element. There are 2 golf courses in Kenmore and another 4 within a 30 min drive. Come and start your own love affair with this captivating haven in the heart of Scotland and find yourself returning again and again! In Kenmore a historic archway takes you onto the Taymouth Castle estate.